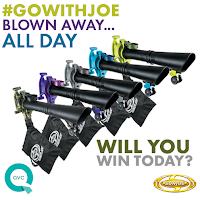 Our client Snow Joe + Sun Joe regularly appears on day-long QVC segments to sling super-hot deals on their high-quality, innovative, and affordable outdoor tools. This presents the perfect opportunity to promote these “Snow + Sun Joe Days” with our highly-engaged Facebook fan base. Giving away products on Facebook at the exact same time that fans can watch the products live on TV – a two-screen sweepstakes – is an excellent way to rev up fan enthusiasm and gain new fans for weeks to come. Here are some tips on pulling it off. Be a tease: Give your fans just enough information in the days leading up to the TV event. You want them to have a basic idea about what’s to come, but also want them to be checking back regularly for more details. Make a splash: The goal is to create a fun day. Fans should know exactly when and where they can see your client on TV, what they can win on Facebook and why they should make sure to stay “glued to both screens.” Make sure you have custom graphics, theme and hashtag ready to go. Encourage fans to share and interact for further reach. Double the pleasure: Whenever your client is on TV, you need to be active on social media. Remind the fans that your client is back on both screens and that they should both watch (for the great deal) and enter to win. Consider running multiple individual sweepstakes that only last as long as the segment will be on TV – this concentrated push yields intense fan interaction. Do it live: Give your fans a total experience. Take screenshots of the TV segment, post quotes and screenshots from the segment as they are happening, ask for feedback and comments about what is being seen on TV, and reiterate the main messages and product benefits as they are presented. This gives the fans a feeling that they are special to you and that you appreciate them (which you do, right?). Most importantly, have fun, engage constantly and be loose! Being on TV is a large commitment, and your “two-screen sweepstakes” social media plan should be epic and thorough.